AP PGECET 2019 : Admit Card Released!! AP PGECET 2019: It is an annual state-level exam conducted by Andhra University, Vishakhapatnam on behalf of APSCHE (Andhra Pradesh State Council of Higher Education). This annual state level exam is conducted for candidates who are interested in taking admission in Postgraduate programs in the field of Engineering, Technology, and Pharmacy. Latest Update: AP PGECET 2019 Admit Card Released!! Get Your Admit Card from the Link given below. Latest Update: AP PGECET 2019 Application form is available from 2nd March 2019 Check Last Date Below. Latest Update: AP PGECET 2019 Exam Date Announced!! Exam Will be Organized in between 1st to 4th May 2019. AP PGECET is known as Andhra Pradesh Post Graduate Engineering Common Entrance Test, and it is expected to be held in May 2019. The Aspirants who are all set to apply for the AP PGECET can apply online between March 2019 to May 2019. The official notification for AP PGECET will be released by the university on the official website, in due course. In this article, we are going to elaborate all the known details such as AP PGECET 2019 Exam dates, Syllabus, and procedures to apply online for AP PGECET, based on past records. AP PGECET 2019 offered Programs:- Postgraduate pharmacy, engineering, and planning courses. All the Candidates should be of Indian nationality. The Applicants must belong to the state Andhra Pradesh. Applicants should also satisfy the local/non-local status requirements as laid down by the Exam authority. Candidates must have qualified B.Pharma, B.Tech or its equivalent degree with 50% marks (45% marks for reserved categories) from any recognized college or university. Appearing candidates in the qualifying exam are also eligible to apply. If you are eligible for the AP PGECET 2019, then you can Apply online for this exam whenever the Application form will be released. After filling the details, you will have to pay the AP PGECET Application Fee. At this point, you have successfully applied online for the exam. 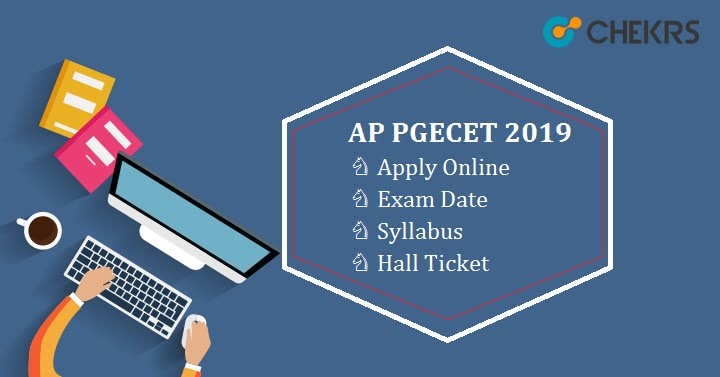 Now you have to wait for the AP PGECET 2019 Hall ticket, After getting the hall ticket you will appear in the AP PGECET. If you qualified the exam with more than AP PGECET Cut-Off Mark, you will be called for the counseling process. If you qualify for the counseling process, you have to fill your choice of courses and colleges through the website. After the seat allotment, students have to download the seat allotment letter and report to the allotted college with necessary documents and fees. All the aspirants who are interested in AP PGECET, Are advised to check the official Website regularly for accurate dates, All the tentative dates of Events are In the table given below. All the interested candidates can apply online for AP PGECET 2019 using the precise Steps given below. So follow these steps carefully and one by one so you will not face any problem in Appling online for AP PGECET 2019. Go to the official website. And find the “Fee Payment” link. Now you have to fill all the details here and click on “Make Payment” button. After the successful fee payment, you will get the Payment ID for further use. Now, click on “AP PGECET Fee Payment Status”. On the next page, Login with the “Payment ID” & “Mobile Number” to check application fee status. Then find and click on “Fill AP PGECET 2019 Online Application Form” button. Carefully Fill your personal details, qualification details, aadhaar card details (*mandatory), address, etc. After filling all the above details, you have to upload your photograph and signature in a given size and format. Click on Submit and at last, click on “Print AP PGECET Application” Take a print out because it will be helpful for future use. The Application fee can be paid through AP online center, debit/credit card, and Net banking. AP PGECETapplication fee will be around Rs. 400/- for SC/ST candidates. After helping you in submitting the Online Application form, here we are also providing you all the details about AP PGECET 2019 syllabus and Exam pattern. The AP PGECET exam will be organized through computer-based (Online) mode. The question paper will be in the English language. There will be 120 Objective type & multiple choice questions in the paper. The exam duration will be 2 hours. One mark will be provided for each correct response. Each question carries 1 mark, and there will be No negative marking for wrong answers. All the Candidates should prepare for the AP PGECET 2019 Exam as per the officially prescribed syllabus. This will be available in pdf format before the exam on the Official website. Different Courses will have the different syllabus. So make sure to download correct AP PGECET 2019 syllabus. The syllabus will consist of topics from the subjects of qualifying exam of the relevant field. Also Check AP PGECET 2019 Previous Year Papers. AP PGECET 2019 Admit Card will be issued through online mode on the official website. AP PGECET Hall ticket is expected to be available in the last week of April 2019. All the Candidates have to enter registration number and date of birth in order to download the hall ticket. Candidates are advised to keep the AP PGECET 2019 Admit card safe because They must have to carry the AP PGECET hall ticket at the exam center. Before starting your preparations for AP PGECET 2019 exam make sure to understand the Exam Pattern and AP PGECET 2019 syllabus. Organize your Study space, So it will help you to better focus on your Studies. Practice on old Exam papers, so you will be used to the pattern and sections of the Exam. Stop studying at least 15 minutes before the exam. 1 hour is preferable. Candidates can download Question papers of previous year exam from the official website and other online sources. Previous year exam papers will be definitely helpful in your preparations. Exam authority will also release AP PGECET Answer Keys for all the papers after the exam so candidates can observe the mistakes and their performance. The AP PGECET results are expected to be released in 2nd week of June 2019. Candidates will be able to check the AP PGECET 2019 Result by going through the Official website and entering the hall ticket number there. There will be no minimum qualifying marks for SC/ST candidates. Except for SC/ST candidates, The qualifying marks of AP PGECET exam will be 25%, i.e. 30 marks. Within a week after the declaration of result, AP PGECET Rank Card will be issued. According to the ranking in the Rank card candidates will be called for the Document verification and counseling. The AP PGECET Counseling process will begin in June-July 2019. The complete process of counseling and AP PGECET 2019 Seat Allotment, is completely online. Qualified candidates must have to register them self online after counseling information updated on the official website. After that candidate will be called for certificate and document verification. After seat allotment, a candidate can download the seat allotment details and have to report to the allotted college with necessary documents and fees. All the aspirants who are all set to apply for the AP PGECET 2019 are advised to apply online before the due date to eliminate the huge late fee. AP PGECET is a great opportunity for candidates who are interested in taking admission in Postgraduate programs in the field of Engineering, Technology, and Pharmacy. At Last, I want to say only one thing to all the candidates that “ Don’t Stress, Do Your Best and Forget the Rest”.